Nobody Move Or The Doggy Gets It! 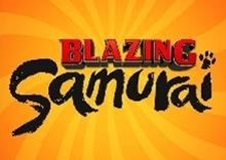 Over at Cartoon Brew there’s a new article about an upcoming animated film called Blazing Samurai. Does that title sound a little familiar? Maybe it’s because the whole idea of the movie is an animated re-make of Mel Brooks’ classic western comedy Blazing Saddles — but this time, with dogs. And samurai. Yes. “In this version, a dog named Hank travels to a small town in ancient Japan to fulfill his dream of becoming a samurai. He discovers the town is populated entirely by cats, and must overcome prejudice while learning how to be a great warrior from a once-great samurai cat named Jimbo. Chris Bailey, who directed the Disney short Runaway Brain and animation directed Alvin And The Chipmunks, and veteran animator/story artist Mark Koetsier will co-direct from a screenplay by Ed Stone and Nate Hopper.” The film is being distributed by Open Road Films, who last year brought us The Nut Job. Check out the rest of the article, and look for Blazing Samurai to hit movie screens in April of 2017.